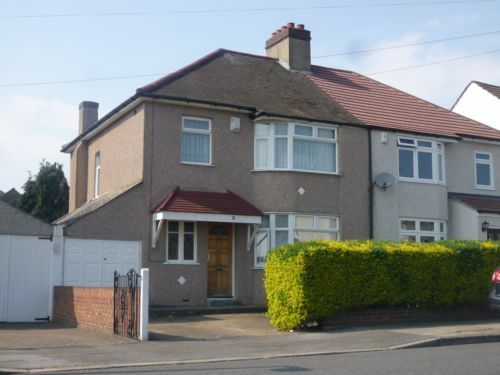 **BEXLETTS HAVE LET THIS PROPERTY** Bexletts are pleased to offer this spacious three bedroom semi-detached property situated in Bexleyheath. The property comprises of entrance hall, lounge, dining room, kitchen, seperate W.C, 2 double bedrooms, 1 single bedroom and shower room. Also offering garage to side, driveway to front and large rear garden. Gas central heating and double glazed. Unfurnished. Available early June. Sorry, NO DSS. Carpet throughout hallway and stairs. Carpet, double glazed bay window to front, radiator and gas fire. Carpet, double glazed patio doors leading to garden, radiator. Vinyl flooring, tiled walls, double oven/grill, electric hob, stainless steel sink. Access to downstairs W.C and garage. Carpet, double glazed window to front, fitted wardrobes and radiator. Carpet, double glazed window to rear, fitted wardrobes and radiator. Walk in shower, hand basin, W.C, airing cupboard. Patio area, mostly lawn with trees and shrubs.